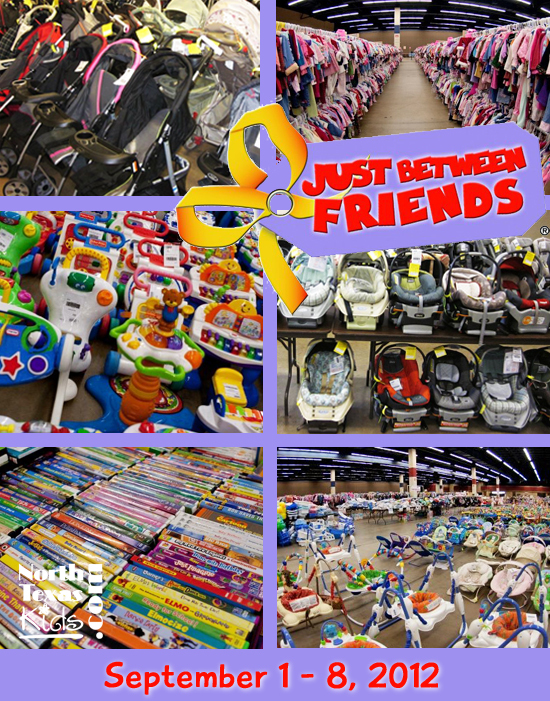 Just Between Friends (Fort Worth) – Biggest kids consignment sale in Texas! Gently used and new items from 1200 families mean great selection and fantastic deals! Kids & infant clothing, toys, furniture, strollers, books, maternity clothes and much more. Just Between Friends Sales events are a savvy shopper’s dream! These are not retail stores but rather savings extravaganzas–shopping events that happen usually twice a year per location. At these events, consignors bring their new and gently used children’s and maternity merchandise to sell. Shoppers can then browse and purchase these items at great savings, usually far below retail prices. Upcoming twice-a-year sale for the best one-stop children’s and maternity shopping in town! No need to go from store to store, Just Between Friends has it all in one place. Shoppers can save 50-90% off retail prices on name brands. Shoppers will be amazed at the deals you can find in 75,000 square feet full of bargains. Sell your kids items for cash and make room in your closets. Join Just Between Friends as a consignor and make up to 70% on your items that sell. Volunteers get to shop first and enjoy even better selection. It’s easy to sign up online at www.jbfsale.com/fortworth. For more information, visit their website at www.jbfsale.com/fortworth and connect with them on Facebook: facebook.com/JBFFortWorth.